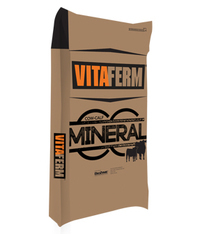 The VitaFerm® Cow-Calf Mineral is an economical line of vitamin & mineral supplements for beef cattle that supports the health of the cow and her calf. The Amaferm® advantage for a pasture/roughage stretcher to maximize producer profits regardless of the state of the cattle market. Vitamin and mineral package exceeds recommended trace mineral levels to support the health of the cow and her calf.